trim healthy mama – Now I Can Have My Cake And Eat It, Too! You can used brown rice pasta, corn pasta, rice pasta. There are any number of choices out there. For my THM friends there is Dreamfields Pasta. It is, however, not gluten-free so that is not an option for me. When I make dinner, my whole family eats gluten-free because I don’t want to have to make two separate meals because I can’t have gluten. That’s just too much work for my taste. Cook your pasta until JUST done. You will cook with the sauce a bit. If using Dreamfields Pasta, cook according to packaging. Brown onion, lean ground meat, mushrooms and garlic together in medium pan until hamburger is no longer pink and onion is translucent. Season with garlic salt and pepper to taste. Once the hamburger mixture is done, add sauce, tomatoes, Italian seasoning, garlic powder and pepper. Add cooked pasta and stir to mix well. 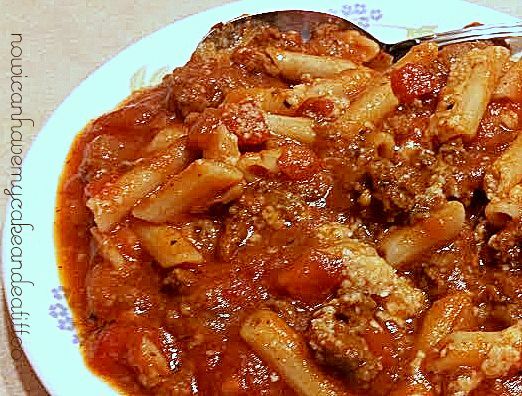 (If you are a THM’er, DO NOT add pasta to sauce, as you cannot reheat pasta). Simmer sauce for about 5 minutes. Add Stevia or sugar to taste. My husband likes his sauce on the sweet side. So, I’m posting my sugar-free salted caramel sauce now. Better late than never, right? I do have to tell you something funny that happened while I was trying to make it, though…I read the recipe wrong and instead of adding 1/4 t. of molasses, which the recipe called for, I added 1/4 c. molasses! My sugar-free salted caramel sauce was very dark while the sauce I was replicating was very light. As soon as I added the molasses to the pan, I knew it was wrong. So I ran back and read the recipe and sure enough, 1/4 t. not 1/4 c.
Funny enough, it tasted fine. I was able to use it for the cheesecake. I thought for sure I would have to throw it away, but I tasted it before I poured my cream in and it was good, so I poured my cream in and carried on like nothing happened. And while it was darker than the original and it was quite rich, it worked out great and the flavor was good! So I changed the recipe a little because if 1/4 c. was good, I can definitely add more than 1/4 t. I made a couple other changes, too, so here is my adjusted recipe. You can find the original on mrscriddleskitchen.com. Heat butter and molasses til butter is melted and molasses is thin; add sweetener and stir well. Heat this mixture over med-high heat until it becomes thick, stirring often. Add caramel extract, cream and salt and stir well. Heat til warmed through; remove from heat. Allow to cool just a few minutes before pouring into a jar to cool completely. Note: This sugar-free salted caramel sauce is fantastic on my Chocolate And Salted Caramel Cheesecake, but you could use it for all kinds of things. 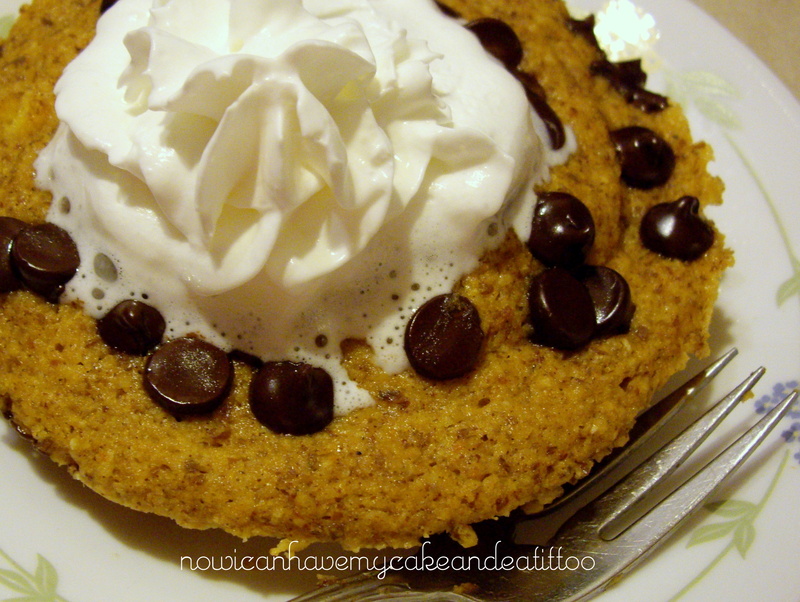 Drizzle it on a Muffin In A Mug, in your morning coffee, over ice cream (THM approved, of course), you could even put it on apple crisp, YUM!! Have fun with it!! Have you entered my Glutino Giveaway?? Hurry before it’s too late!! Y’all know my love of all thinks pumpkin, right? Well I have found yet another! Hubby came home this morning with a cake pop/donut hole maker! Yay! I have been wanting a donut maker for a while now. I saw one on an online yard sale site the other day and it was a great deal but the guy selling it was kind of yanking my chain a bit and my husband wasn’t going to play his game. So he went and bought me one of my very own from the store. Gosh, I love that man. So, of course the first thing I made was these Pumpkin Poppers. In a medium size bowl, combine all dry ingredients; mix well. Combine wet and dry ingredients; mix just until combined. Spray donut hole maker or donut pan with non-stick cooking spray. Fill donut hole pan holes to overflowing; close and snap lid closed. If using donut pan, fill to just full. Cook for 8 minutes or until poppers are done. They will not sink in when you try to lift them out when they are done. (I’m not sure how long these will take in the oven. I would start with 10 minutes and go from there). Remove from maker and cool on a wire rack til completely cool. Whip cream til it starts to become thick. Add sugar and cinnamon; beat til thick. 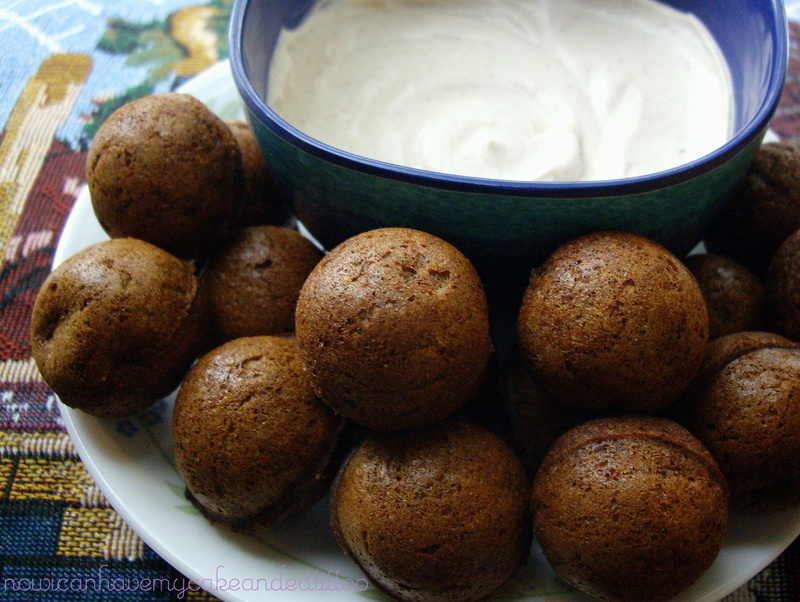 For all my THM friends, these pumpkin poppers are a fabulous S snack/dessert. Please keep your carbs to 10 or less when enjoying these. You could even add a couple oz. of cream cheese to your dip, that would be delicious! MMmmmm, an idea for next time! I know, I know. A peanut butter cup shake doesn’t sound healthy. But it actually is. It’s quite healthy. 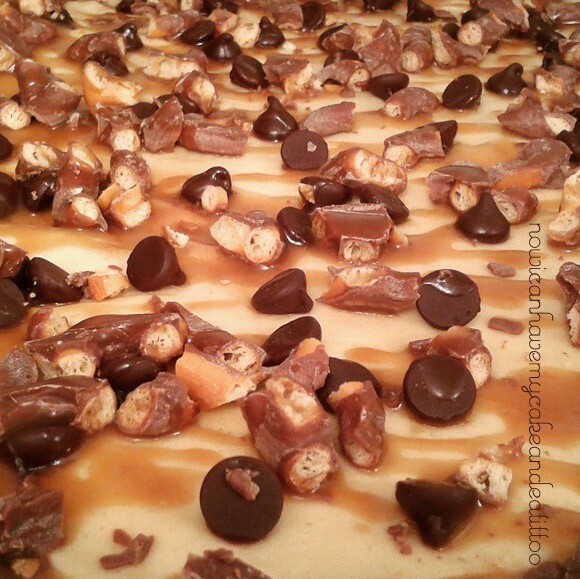 And if you can have your chocolate (and peanut butter ) and eat it, why the heck not, right?!? RIGHT!! 😉 I just know y’all agree with me on that point, because ummmm… CHOCOLATE (and peanut butter)!!! Haha…check this out. This peanut butter cup shake is amazingly similar to a certain brand of peanut butter cups. So similar that if I have a craving for those certain cups, I whip one of these up and BOOM, no more cravings! I found this recipe online…actually I found for this online, but I changed it up so much that I’m not even going to link to the original. I made it to fit my needs and my budget. My version doesn’t have any ‘specialty ingredients’ that are hard to find or cost an arm and a leg. You’re welcome….now on to the recipe for this delicious peanut butter cup shake. Add everything except water and ice to blender. Blend slightly; add boiling water (this will melt your oil). Now add ice and pulse. Notes: This recipe is easily doubled or tripled to serve 2-3 people. As written, it is a single serving. 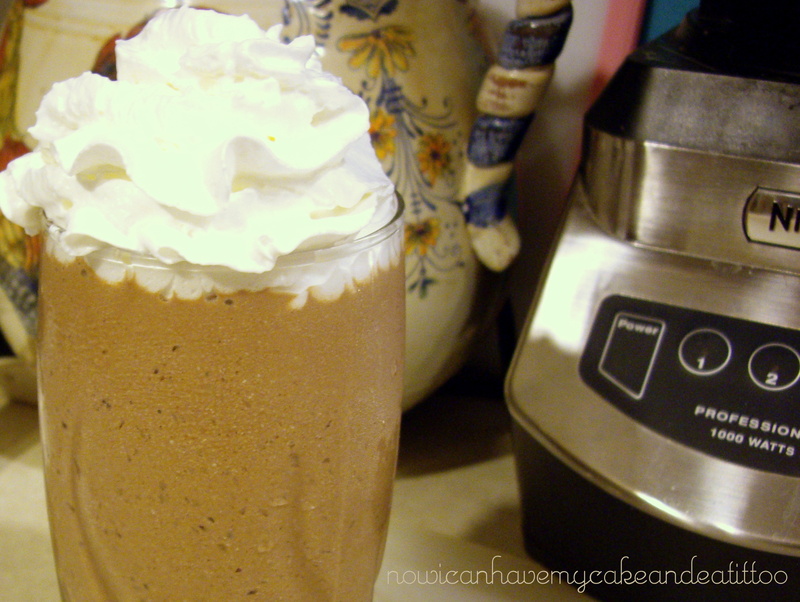 This peanut butter cup shake is a delicious S meal/snack. Be sure to keep your carbs to 10 or less when enjoying this shake! I have been scouring the interwebs for new and exciting recipes for me and my family to try. Recipes that are not only exciting but that are healthy as well. That is important to me. More important than being exciting….maybe. Okay, probably not but pretend you believe that okay? Pinky promise? 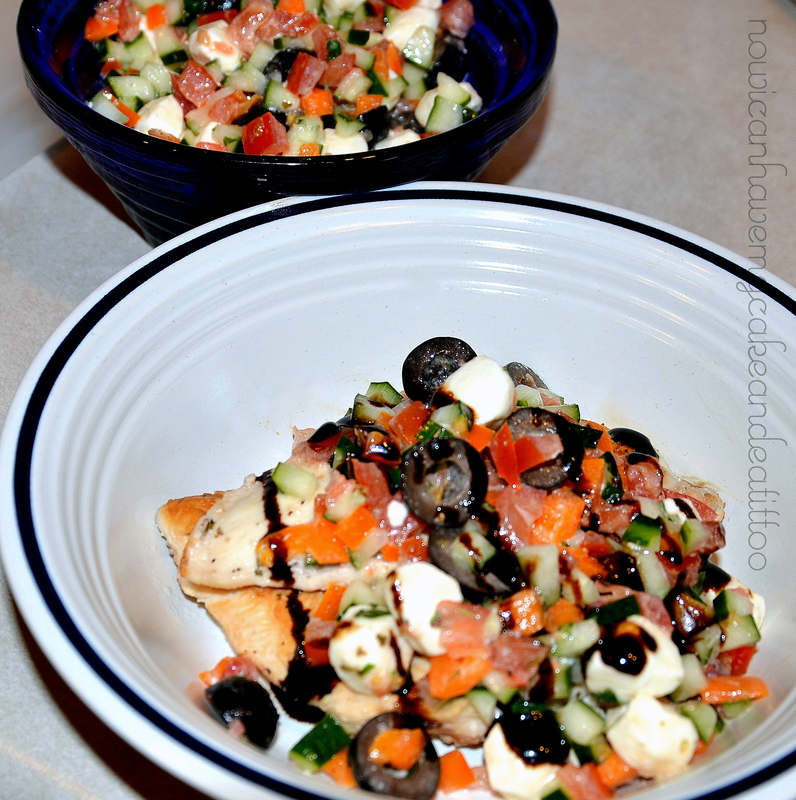 Mediterranean Grilled Chicken sounds exciting, doesn’t it?!?! And it’s certainly healthy…at last this version is! Any who, as soon as I saw this recipe, I knew I had to try it! It looked so yummy with the olives and tomatoes. YUM! So I made a couple changes cuz hey, she’s not the boss of me! This is what we ended up with for dinner one night. Meanwhile, to make the salsa, add all the salsa ingredients together and refrigerate until ready to use. Note: If you do not have garlic infused wine vinegar, add about 1/4 tsp minced garlic to the marinade. You throw everything together in a bowl over a couple of chicken breasts cut in half, throw it in the fridge for a couple of hours. You take 10 minutes to make this delicious salsa, throw that in the fridge. Then when it’s time to eat, you take everything out of the fridge, another 10 minutes to grill the chicken breasts, top with your salsa and BOOM! Time to eat. It really doesn’t get much easier folks! I’ve been wanting to try this Big Mac Salad for a while now. I hadn’t yet til last night because…well frankly, I’m lazy. You have to make the ‘special sauce’, cook the burger, cut the burger, get all the toppings ready….it’s a little bit of work. But let me just say, this Big Mac Salad IS WORTH IT!!! Now, I haven’t had a Big Mac in a while (gluten intolerant, remember?!? ), but from what I do remember of these sandwiches, this is pretty close. And even if it’s not, it’s so good, I DON’T CARE!! Just look at that! So very yummy!! You want this Big Mac Salad Recipe, don’t you? I knew you would! Here’s where I got my inspiration from…OurAbundantBlessings. Combine all sauce ingredients; allow to sit in refrigerator for a few hours for the flavors to mingle. Layer vegetables into a bowl or onto a plate. Top with cheese covered hamburger patty. Spread your ‘special sauce’ on top. 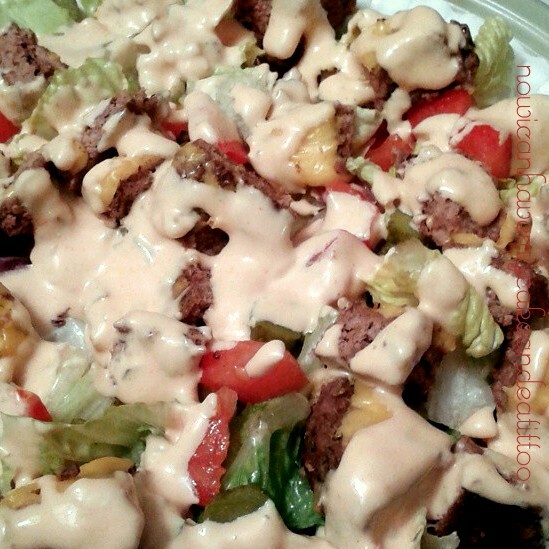 Notes: This Big Mac Salad is a delicious S for those living the THM lifestyle! Please keep those carbs to 10 or less! Also, let me remind you that if you do not like any of the ingredients listed, feel free to omit them and only use those you like! This recipe is very versatile and can be used by anyone! 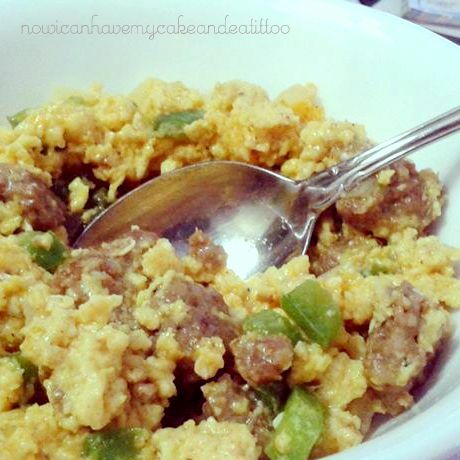 Anywho… thought I’d share this eggs n’ sausage recipe with y’all cuz it’s super easy and super yummy, too! Brown sausage in a medium size skillet. Once sausage is browned, add pepper and onion and cook til onion is translucent and pepper is soft; season veggies a little. While veggies are cooking, whisk eggs, cream and salt and pepper together in a medium size bowl til frothy. Once veggies are ready, add eggs to pan and cook until just done; turn heat off. Allow cheese to melt before serving. Enjoy these delicious eggs as part of an S breakfast, lunch, brunch or whathaveyou… these are delicious any time of day! For those following THM, since these are an S, be sure to keep your carbs to 10 or less! I have pretty much made the same meat loaf recipe since I’ve been married. I never deviate from the recipe my MIL taught me to use. Ground meat, crackers, egg, onions, spices, a touch of ketchup or bbq sauce in the mix and on top, bake and you get a moist, yummy meat loaf very time, without fail. Until tonight. I deviated. And I’m glad I did. This meat loaf is full of flavor, super moist and the yum factor? A solid 10 out of 10!! You want the recipe don’t you? Lucky for you, I’m sharing it here today…right now!! Lightly grease a loaf pan with non-stick cooking spray; set aside. In a large bowl, combine meat, eggs, breadcrumbs, herbs, onions, salts, pepper 1/2 of shredded cheese and parmesan cheese. Lightly mix with hands just until incorporated, DO NOT over-mix; place mixture in greased loaf pan and gently press to form meat loaf. Place loaf pan on a baking sheet in oven and bake for 45 minutes. Remove from oven and sprinkle with a little more parmesan and remaining shredded cheese. 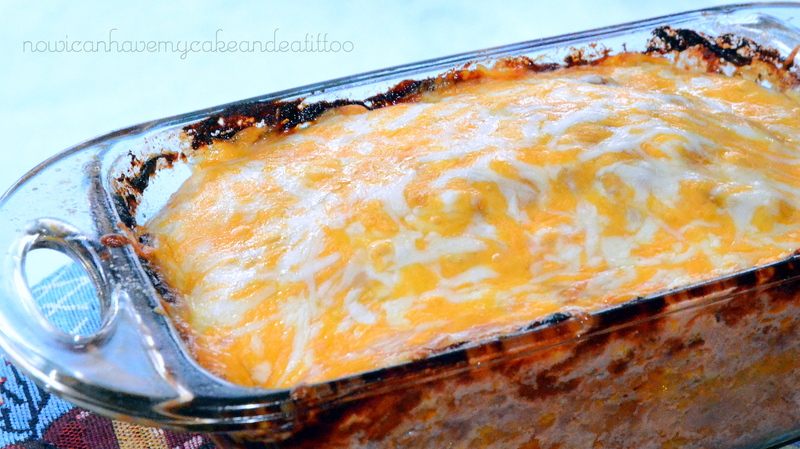 Return meatloaf to oven and bake another 10-12 minutes or until cheese is melted, bubbly and browning around the edges. Remove from oven, drain any grease/fat from loaf pan and allow to rest for 5-7 minutes before cutting and serving. Enjoy this delightful change-up to your regular every-day meatloaf!